Roger Dean Complex, Jupiter, Fl., Nov. 16, 2013– Michael Richards wanted the ball. Red Sox players wanted him to have it. 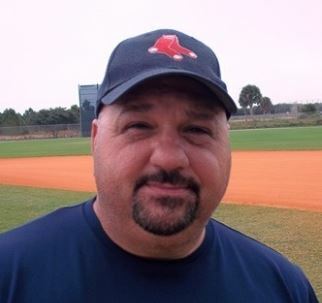 So, the smartest move Atlanta Red Sox manager Gus Dotsikas made all tournament was also his easiest. Richards was brilliant, holding the Rhode Island Sea Dogs in check for six innings, before Rozzeto Gordon completed the eight-hitter as the Atlanta Red Sox won their second Fall Classic championship with a 5-2 victory. “I felt strong. There were no elbow problems today,” said Richards, who improved to 2-0 for the tournament. “A lot of guys wanted me to get the ball [for the semifinals], but they were glad I had it today. Atlanta, which won the 45-and-over title at the 2009 Fall Classic, beat the Florida Sea Dogs 13-1 in the playoffs behind Steffen Majer’s five-hitter to secure a spot in the finals. The team needed every strike Richards could muster in a tight championship game that wasn’t decided until the Red Sox pushed across two huge insurance runs in the bottom of the eighth. Relying on a lively fastball that kept Rhode Island hitters off balance most of the way, Richards left with a lead in the seventh before turning the game over to Gordon. The closer’s 1-2-3 ninth was indicative of a pitching performance that was everything Dotsikas could have wanted. While Richards was dominant, he was also the recipient of two key defensive gems. Tim Garren made a deep, running, over-the-shoulder catch to end a two-on, two-out Rhode Island threat in the second and preserve a scoreless tie, before Shawn Callaway, who replaced Garren in left field, made an amazing catch running toward the left field corner in the eighth inning to stymie another Salty Dog rally. Atlanta also got some timely hits. When one of two costly Rhode Island errors allowed Callaway to reach scoring position, team leader Chris Jackson promptly drove him in with a single to right to score the game’s first run. The third-inning lead doubled when Jeffrey Burns hit a run-scoring single to left center. Rhode Island pulled within a run in its next at-bat when Scott Woodward drove in Mike Lunardelli with a single to right, but it was here, with the Salty Dogs poised to re-take the lead, where Richards was at his best. Facing a no-out, first and second situation, Richards retired Rhode Island on back-to-back strike outs and a ground out to first. The lead was preserved and the Salty Dogs best opportunity had been smothered. “The third and eighth innings definitely didn’t help us,” said Clark. Callaway’s booming two-out double to left a half-inning later, one of his two hits on the day, restored the Red Sox’s two-run lead. But Norm Dumont pulled Rhode Island within 3-2 with a sacrifice fly in the seventh to set the stage for the clinching eighth. Once again it was a costly error that plagued the Salty Dogs, as a bases-loaded ground out allowed Jackson and Burns to score when the relay throw for a double play was off target. Atlanta now had a more comfortable 5-2 lead and all that was left was for Gordon to set Atlanta down in order and clinch the title. “When we got those two in the eighth, you could finally exhale,” said Dotsikas. “When you have a dominant pitcher like Gordon on the mound, those two runs are big. “It was a total team effort,” Dotsikas said, making special reference to Tom Nohstadt, a former college player who worked with teammates in the cages throughout the week to help keep them tuned up. The victory was the second of the tournament for Atlanta over Rhode Island, as the Red Sox, who finished the week a perfect 7-0, earned an 8-7 win during round robin play. The Salty Dogs reached the title game by going 4-1 in round robin play, before topping the New Jersey Reds, 4-3 in the playoffs. Woodward hit a game-clinching RBI double in the eighth and Dan Fitta tossed five strong innings to earn the win.